California has had a long history of mountain fire fighting, but I will make no attempt to summarize it here. I have, however, collected some interesting tidbits, and I present them below. Some useful references include The California Department of Forestry and Fire Protection (Cal Fire), which contains a history of fire fighting in California and references to the state’s Air Attack Bases and a 2007 newspaper article (The Union Democrat) that describes fifty years of firefighting in California. Very useful is Frederick A. Johnsen’s video book Fire Bombers in Action, published by Specialty Press and Tom Janney’s “Airtankers, An Historic Overview”, pages 12-15 in CFPA News, Aug 2012, The California Fire Pilots Association newsletter. The late Linc Alexander’s e-book Firebomber into Hell contains a chapter on fighting fires in California. More details on the aircraft listed below can be found by searching for the Bureau Number at the Warbirds Research Group and elsewhere in this archive. California was in the former U.S. Forest Service Region 5, thus the aircraft were designated with the letter E (Johnsen 2010). Below I discuss some aerial spray companies based in California that owned and operated some of the TBM Avengers that eventually came to New Brunswick. I spent some time collecting information from the Web and from members of various online discussion groups. The results are not exhaustive, and should be viewed as only a beginning. In Loving Memory of my father, Captain James Lynden Betts. At the end of his career Jim had over 40,000 logged with almost all “Flying low and slow”. Born in Columbus Ohio, he fell in love with flying at 10 years old. He worked every job possible to pay for his flying lessons. In 1939, he was hired by Steve Whitman as a flying instructor in Oshkosh Wisconsin. An article in the Columbus Dispatch stated, that at the time, he was the youngest flight instructor in the United States. Jim joined the fight as soon as war was declared and flew TBM Avengers until about halfway through the war when he lost his flight status after a navy doctor mistakenly said he had a heart murmur. He then joined the infantry and fought in the pacific and the Philippines. After the war Jim found work as a crop duster. He bounced around the USA spraying with various operators and then moved to Lancaster California where he opened his own business, CISCO (California Insecticide Company). He bought cheap Stearman’s and built his fleet to over 10 aircraft. Seeing there was a need for additional fire fighting Aviation assets, Jim purchased 3 TBM Avengers and one PB4Y2 and converted them all to water tankers. He quickly got contracts from the California Division of Forestry. Jim operated this company successfully until 1962 when he sold it to a friend. These are some or maybe all of the Avengers that flew for CISCO. Danny Wayne Craig was a crop duster who owned Craig Aero Service in Buttonwillow for many years in the 1970s. 47C and 33Z went to Stewart Aviation of Moses Lake, Washington, and subsequently flew in New Brunswick in 1981 and 1982. Several TBMs bounced around between Craig Aero, Sonora Flying Service and Stewart Aviation. I, 2015 I found reference to a new (to me, anyway) Hemet Valley FS TBM: N9830C / #E69 / BuNo ? / Hemet Valley FS / Crashed on 5 July 1959 near Redlands, CA. Pilot was Donald M. Doughty, age 40 who was presumably killed. 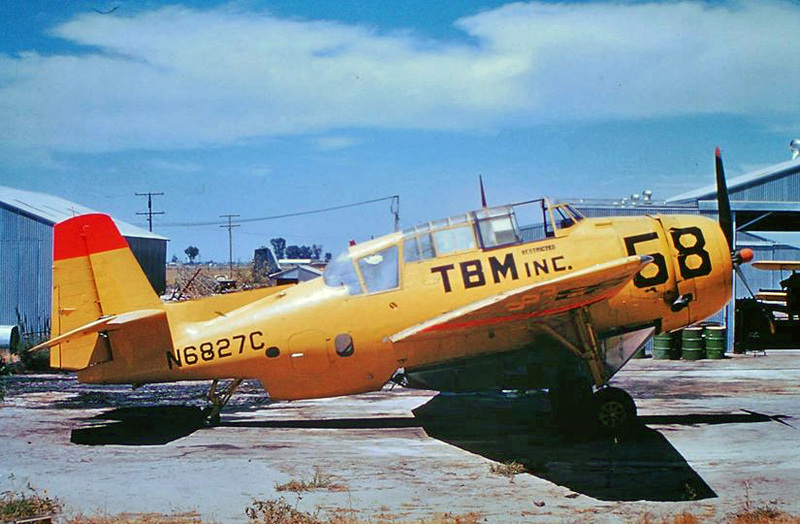 This Grumman TBM-3E departed from Hemet-Ryan Airport on a fire fighting mission. There is a 12-minute 2014 Youtube video that identifies this Avenger as #69. A query to TBMs – Mil and Civil revealed that this aircraft was actually #72, the first of two of that number owned by HVFS. Noticed this Video posted here and wanted to let you know that the Tanker number (#69) in this video is wrong but the N# is right…I contacted Project Remembrance about this and all the parties involved after I saw the video…The Tanker number is #72 N9830C and yes HVFS had two TBM’s that were #72. The second TBM Tanker #72 was N3357G Bu53858 and came on line after 1960 [became C-GFPR]. Tanker #69 [was] N5169V Bu53825 crashed June 22, 1961 during suppression action on a fire on Billy Goat Mtn. 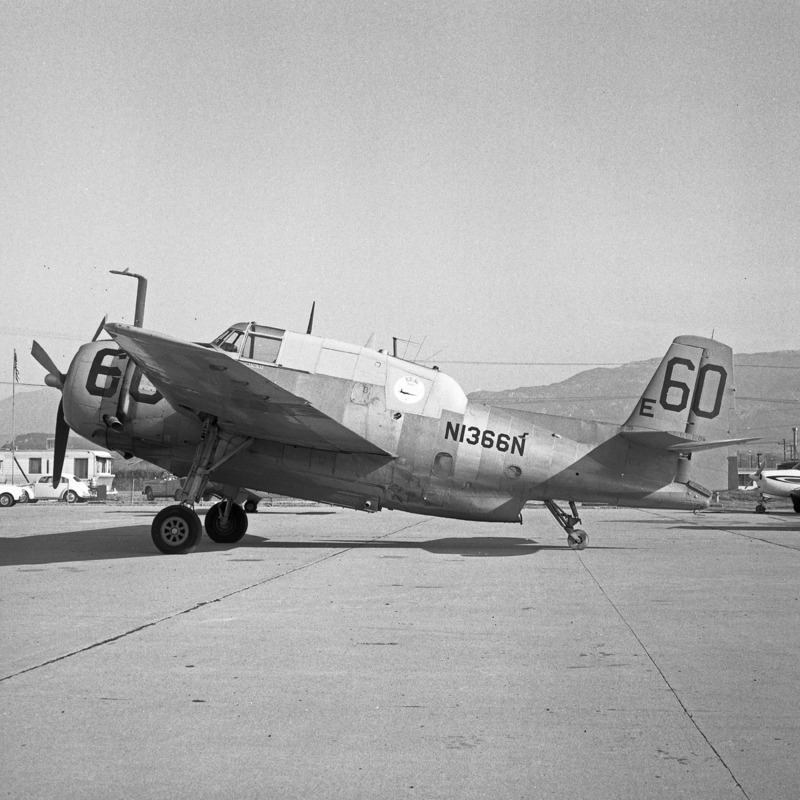 near Aguanga in Riverside County California… Pilot Arthur Deall was killed in the crash….Thanks to Steve Whitby who has the only photo (so far) taken of HVFS TBM Tanker #72 N9830C at Hemet I believe in 1959…That photo was the key in solving this mystery. 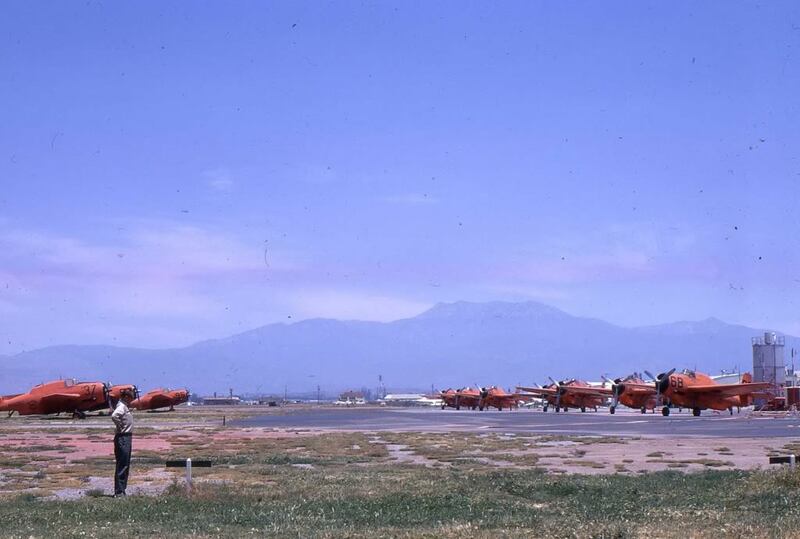 Hemet Valley Flying Service lineup, Hemet, CA, 1965. Photo courtesy of the Steve Whitby Collection. Posted by ? Stein, March 2011 to the Airtanker Memories thread, WIX. Dad looking over the flightline, Hemet, CA, May 1970. Posted by ? Stein, Mar 2011 to the Airtanker Memories thread, WIX. I’m eager to relay to you my visit to Ryan Air Attack Base, Saturday, Nov 20th. I had stopped last week to make arrangements to see Bob Forbes about TBM history. He works out of the base in Ramona seventy miles south of here two days a week, then in Hemet on Fri/Sat. It seemed somewhat ironic that there was a light sweet rain falling as I walked into the small Ryan Base office. After what these Hero Firefighters have been through this past decade on the numerous So. Cal. firestorms, it seemed strangely quiet and relaxed with silent phones and radios. I was greeted again by Mike Venable, Fire Pilot for #73 Grumman S-2T Turboprop Tanker Bomber. His father Jim Venable started Hemet Valley Flying Service back in the ’50s. Also enjoyed meeting I believe Deen Ohel, Fire Pilot for #72 Tanker. He said if it was about TBMs, I definitely wanted to talk to Bob Forbes! I was escorted back to the next small building they call the “Mole Hole”, as per the desk plaque attached to the door. Bob recalled flying #E58 Tanker for TBM, Inc. on fires until it was sold to Hillcrest Aircraft in Lewiston, Idaho. [I] enjoyed hearing how in he ferried the TBM to land at the airport in Lewiston for delivery to Jerry Wilson, owner. Jerry told him, “No, you can’t park it here. You need to fly it over to our overhaul shop down on the river in Clarkston”. He chuckled about landing it on that “gravel road strip” down by the river. I said yes, that was the one I dragged with a tractor to keep down the puncture weeds. After subsequent restoration as “Georgia Peach” with several owners and shipments to the UK, New Zealand, and finally Queensland, Australia it is now owned by Randal McFarlane. Then looking at the photo of Hemet Valley FS #71 N7229C, Bob recalled the engine fire and crash landing by Pilot John Chase. They were fighting a fire near Lake Pyru when a call came on the radio from Chase that he was having engine trouble and would try to make it to the Santa Paula landing strip. His radio apparently cut off when the R2600 engine exploded. Flames where coming right back over the windshield like “in a John Wayne movie”. He had to ditch in a field somewhere around Ojai. As he pulled back the canopy and jumped out the fire instantly singed off half of his mustache. As he ran across the plowed field with his parachute pack slapping his backside he thought he was being encouraged to run faster. Adrenaline just takes over. Sis-Q supplied five Avengers to the spray program in 1971 and 1972. Five were eventually sold to FPL in 1974; these, together with six from Johnson, were FPL’s first eleven TBMs. The company was incorporated in 1960 (see here). An article by Chris Bateman of The Union Democrat of Columbia, California, “Fly-in marks 50 years of firefighting” gives an interesting history of Sonora Flying Service and one of its TBMs, N7226C (26 Charlie). The article is presented below in edited form. … the guest of honor will be a former U.S. Navy TBM Avenger that fought fires at the Columbia Air Attack Base during its first years of operation after once sinking two Japanese cruisers on one day. 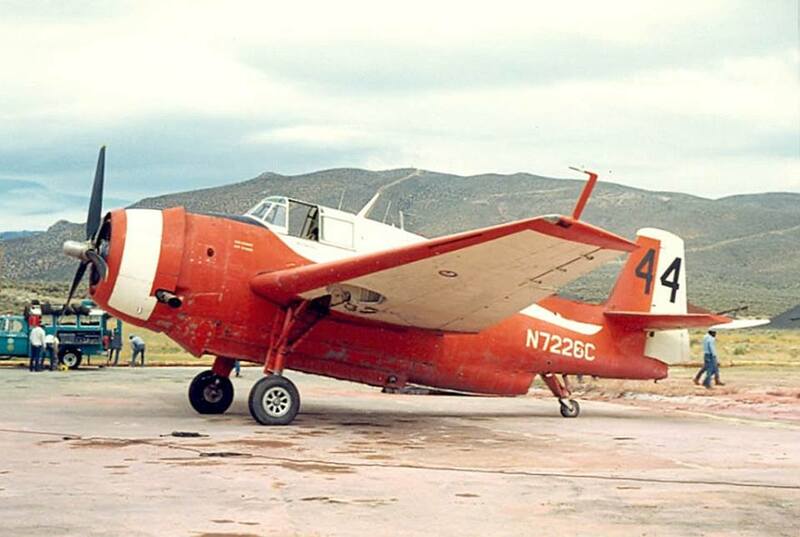 Now owned by Idaho pilot Danny Summers, the single-engined torpedo bomber was converted to drop 400-gallon loads of borate on forest fires by Sonora Flying Service in 1957. It was then contracted to be part of the state’s brand-new firefighting fleet at Columbia in 1958 and 1959 and spent 15 years in the fire service before becoming a crop duster in the mid-1970s. Summers has since converted it back to torpedo bombing configuration. TBMs weren’t the first fire bombers at Columbia; Stearman biplanes were. By the early 1970s the old torpedo bombers had been replaced by safer, twin-engined S-2s. But during the late 1950s and 1960s, the pioneer years of aerial firefighting, TBMs were the heart of the Columbia fleet. The prominent air attack base alum’s visit this weekend will be part of a weekend-long tribute to aerial firefighting at Columbia. A open-cockpit biplane made the first-ever firefighting flight out of Columbia Airport. On July 28, 1957, a radial-engined Stearman dropped 150 gallons of borate mix onto a “highly dangerous” fire … Bought and outfitted for fire bombing by Sonora Flying Service partners Coeur and Bob Roberts, the Stearman had been at Columbia Airport for only a day when it was called into action by the U.S. Forest Service. Milo Peltzer, an aerial firefighting historian living in Porterville, says the Forest Service contracted with Sonora Flying Service in 1957 to conduct aerial fire attacks at the rate of $175 per hour of flight time. 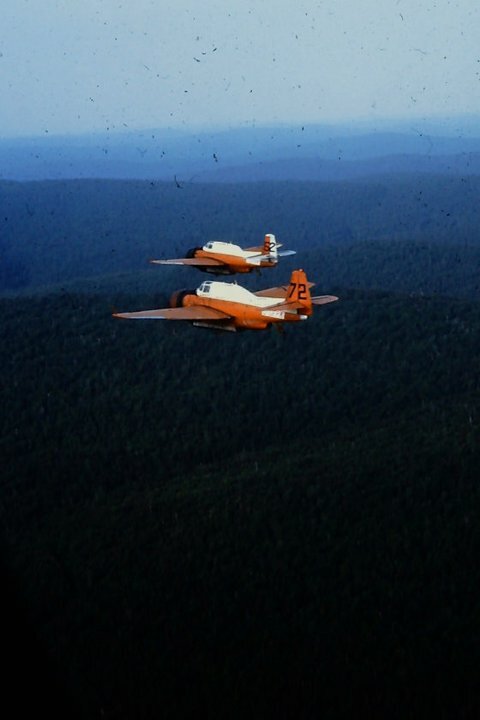 In September, the Columbia-based Stearman and three more attack planes, the paper reported, “flew 100 sorties” in stopping a forest fire on Mt. Provo, near Tuolumne. By late October, Roberts and Coeur had picked up two surplus TBM Navy torpedo bombers in a government auction in Arizona for $4,000 apiece. The Sonora Flying Service partners had seen the future of firefighting, and it was in the air. “We look back on the 1957 air tanker experience with considerable feeling of accomplishment,” Roberts wrote in a Jan. 2, 1958, letter to State Forester F.H. Raymond. Later, he spelled out plans for a large, more efficient attack base at Columbia. Thus ended the first of 50 years of aerial firefighting at Columbia Airport. As the chill of winter descended on Columbia Airport in early ’58, plans for establishment of a California Division of Forestry air base were well under way. When the fire season began, Columbia was one of a dozen CDF bases to open statewide. Today Cal Fire’s statewide fleet includes 23 S-2Ts, 11 choppers and 14 fire-spotting air attack planes. Eleven Helitac and 14 Air Attack bases are open. Columbia is one of only two (the other is in Hemet) combined Helitac-Air Attack bases and one of only three (along with Hemet and Porterville) of the 1958 bases still open. And the $175 per-hour flying time cost cited by Sonora Flying Service? 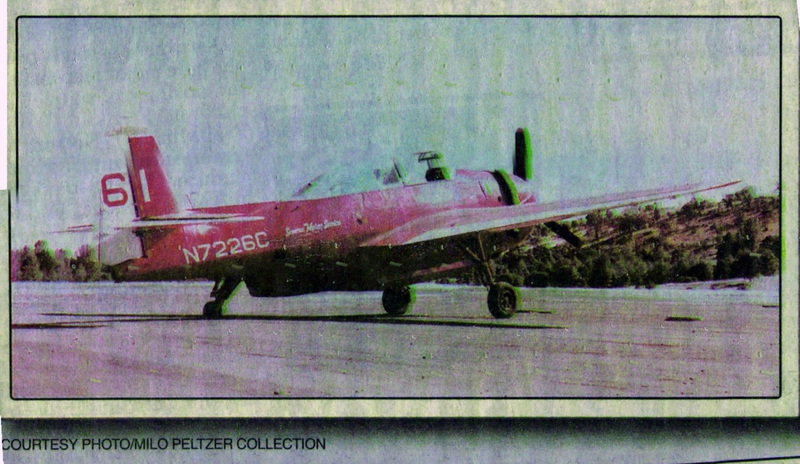 It’s shot up to $2,600 for an S2-T. Of course the new tanker carries 1,200 gallons of retardant to the Stearman’s 150. This weekend’s Father’s Day Fly-In celebrates the first 50 years of aerial firefighting in Columbia Airport. Coeur and Roberts’ first Stearman won’t be on hand, but present and accounted for will be 26 Charlie, one of the two TBM dive bombers the pair bought at Litchfield Park Naval Air Base in Goodyear, Ariz. back in 1957. N7226C Sonora Flying Service #61. Posted by Dan Dineen 30 Sep 13 to TBMs – Mil & Civ. Jim Martinelli … knows the Idaho pilot who now owns 26 Charlie, named for the tail end of the “N Number” on its fuselage N7226C. And Danny Summers agreed to fly the old TBM home for the Fly-In. The two TBMs, outfitted for borate drops, were on duty together in Columbia for the fire seasons of 1958 and ’59. Faster and with a larger, 400-gallon tank capacity, the dive bombers were far superior to the old Stearmans as firefighting planes. Meanwhile, 26 Charlie in the mid-1970s retired to the fields, crop dusting in Bakersfield, Yakima and Moses Lake, Wash., before its value as a WW II warbird rescued it from the fields forever. Summers, who bought the plane in 1991, has restored the TBM to its original, torpedo-dropping condition and has won warbird restoration honors at the nationally famous fly-in at Oshkosh, Wis.
A bit of history will accompany 26 Charlie to Columbia. This TBM, stationed on the USS Wasp flown by Navy pilot Harry Baderow, sunk two Japanese cruisers at Kuri Harbor on July 26, 1945  shortly before the Hiroshima and Nagasaki bombings ended the war. The dive bomber later helped ferry Red Cross supplies into Japan and flew over the USS Missouri as surrender papers were signed. Baderow is now dead, but he lived long enough for Summers to give him a ride in the reconditioned TBM a few years ago. And come Fly-In time, along with its war record, 26 Charlie will bring back colorful memories of fighting fires during Columbia Airport’s earliest days as an air attack base. Sierra Aviation, Porterville, CA, 1963. – Flew as tanker #E44. Wen Inc, Portersville, CA, 1963-1964. Capitol Aire Inc, Carson City, NV, 1970-1972. Craig Aero Service, Buttonwillow, CA, 1977. N7226C, Craig Aero Service, March 1979, Martin Kyburz, as it appears on the Warbird Registry page. Danny Summers/Summers Farm & Ranch Inc, Sugar City, ID, May 1990-2002. 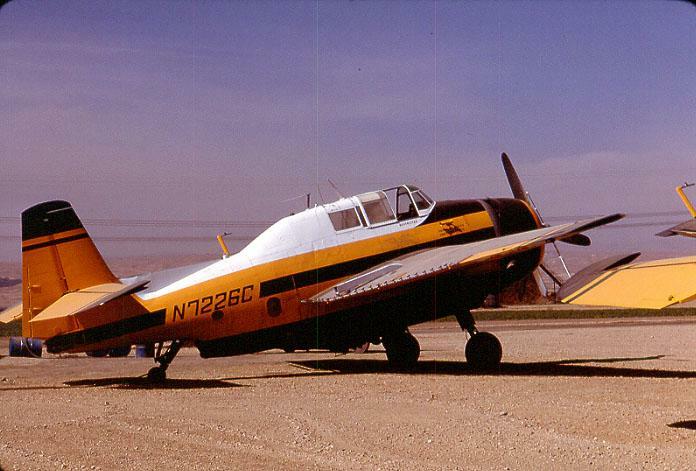 – Restored to airworthy, Jerome, ID, 1992-1996. An article in Warbirds International dated March 2018 describes the restoration of N7226C and shows a few images of its past history: “Pearl Harbour Avenger”. Doug Fisher and Michael O’Leary. 2018. Warbirds International p. 32-39, plus cover. This rare combat veteran TBM-3E was restored by Danny Summers and John Lane and is now owned and operated by Texas Flying Legends. Her military claim to fame was the sinking of two Japanese ships. June 1957 by Henry Moore, Doug Gandy, Harvey Miller, Bob Bunch, Milt Watts, Bob Phillips, Wayland Fink, Jim French, and Elmer Johnson. T.B.M., Inc. has been in the airtanker business since 1959 and has provided continuous state and federal airtanker services since that time. In 1972, T.B.M. acquired a majority interest in Butler Aircraft Company. 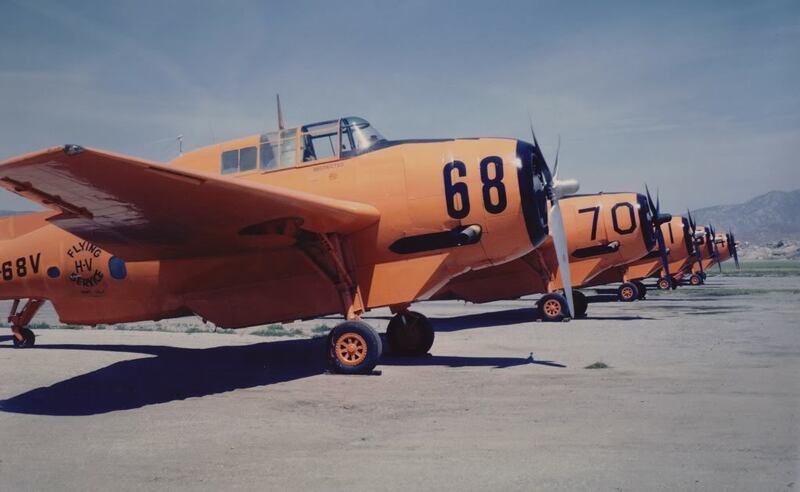 T.B.M.’s first aircraft, the General Motors torpedo bomber TBM, was purchased at a military surplus sale. Aerial firefighting and aircraft maintenance. N6827C / #E58 / TBM Inc.
Other TBM Inc. Avengers included #60 N1366N, N1368N, #36 N1369N and N6829C. TBM Inc. #58, N6827C. Posted to TBMs – Mil & Civ 21 Nov 2014 by Dan Dineen. Thanks for the display. I went to UCSB from 1972-73 and I remember dropping by the airport in Goleta (Santa Barbara) and was surprised to see what I recall was named the Los Padres Air wing of the Fire Service. There was an Avenger, two Tigercats and an old B-17 parked there stained with fire retardent. I wish I had taken photos and have been looking ever since for photos of the Los Padres Airwing so I could model them. This is the first time I have seen a photo of the Avenger. Great collection of facts and stories. Thanks! TBMs were always “underpowered”. The Navy only used them for torpedo work…never as “dive bombers”. The great SBD was probably the best anti-ship weapon of the war. A true dive-bomber. One plane only rarely “sank” a ship as stated. The Navy did a great job of team work to do that. I flew a few tankers in 27 years. Finished up with tanker 70. (not the TBM 70 in the picture but a DC-7. Had a good time. Interesting too. Hank Moore ,TBM, was a fine boss and man. As were all the others I was privileged to work for.